This election has been unlike anything I have ever seen in my life. The inundation of political posts and speeches and posters has been mind-boggling. I have seen less vitriol come from opposing sides in civil wars, fewer insults from belligerent sports team fans. I have heard many exhorting voting in the name of fear, hatred and plain spite. 1. We not only do not have to fear, we SHOULD NOT fear. We are directly commanded over and over in Scripture to have NO FEAR! Why is this election striking so many as terrifying when we are told by the Almighty Lord of Heaven and Earth to have no fear? I firmly believe that as Bible-believing Christians we *should* vote, and do so as the Holy Spirit prompts after prayer and contemplation. However, this horrid fear-mongering doesn't glorify anyone but the sinful self and the devil. This world is promised to end, we cannot avoid that no matter how we try. Our job is to trust the Lord, not fear and share the Gospel. We should be afraid to place our trust in men (or women)-no matter how godly they may seem, whether their values and morals align with ours or not. We must place our trust in the Lord and He has commanded us to not fear. 2. God is still in control. I have what may come as a startling thought to some of you: God may have plans for our nation that differ from your's. I feel that we are desperately in need of some discipline, much grace has already been extended. Trust that no matter who is declared the next_______ (fill in government official) that God ultimately will be the One that allows that to take place. He is fully aware of what is taking place, He is hearing our prayers, and hopefully seeing our actions done in faith. He will do, or allow to happen, whatever will bring the most hearts to Him. 3. He can work any outcome out for the good of those who trust in Him. All of America is not saved. But if you are, you can believe that He will work this for your good. We should be much more concerned for those who can't claim this promise than worried over the next president. 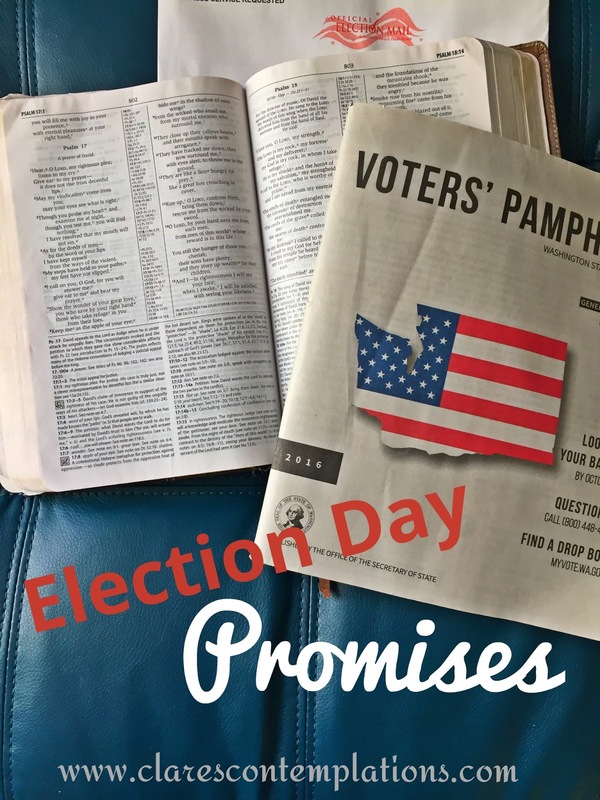 The Lord invites us to participate in His will, and we can do that by praying for wisdom for all voters, carefully selecting our candidates and participating in thoughtful, constructive discussions about the state of our country. Leave the rest to a God who truly has our best interests at heart. He hasn't changed since He spoke Jeremiah 29:11. 4. Our mission remains unchanged. We cannot neglect that the Great Commission is not "vote for X" but to go into all the world to share the salvation available to all through Christ. We do not know how the Lord will work, but He promises He *will*. He has ALL the authority! And that is all we need to know. Perhaps the candidate we abhor will be elected. But who are we to doubt that may be because it will provide us with even more opportunities to share true hope with a hurting world? Few whose lives are perfect feel a need for a Savior. But everything seemingly going wrong prompts many to look for answers. We've got 'em, we just need to share them. Please, hear me. We cannot afford to "stick our heads in the sand" but often we can be accused of forgetting Who is really in charge. And it has nothing to do with what is decided at the polls. This is an opportunity to let our light shine, to really be a voice for true change in a nation that appears to be going mad-and that doesn't stop after we cast our ballot. He has always been here, and He will still be God on November 9th. Let's make sure the whole world knows that. I can promise you-nothing will glorify Him more.